1. Combine all ingredients together and shape into beef burger patties. 2. Fry in oil for about 5 minutes on each side or until done. 3. 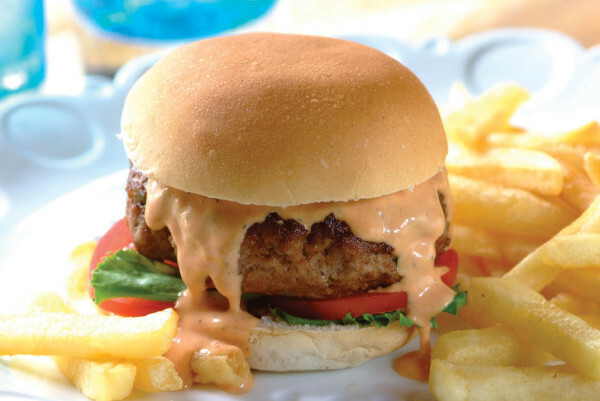 Serve the hamburger patties on bread rolls, with a slice of tomato and lettuce and topped with pink sauce, and a portion of French fries. Fry an egg and place on each Burger. 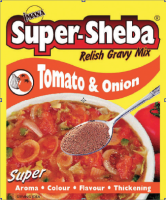 Make a relish by boiling together 1 x 410g tin of Tomato & Onion Mix and 3 tablespoons of IMANA SUPER-SHEBA Chilli Beef Relish Gravy Mix. Boil until thick and glossy. Serve over your burger. Garnish with a Chilli. 1. 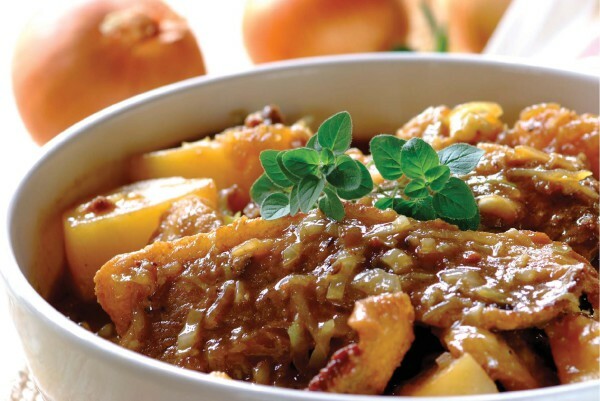 Combine the mince, egg, oats and dry contents of the IMANA Brown Onion Gravy. 2. 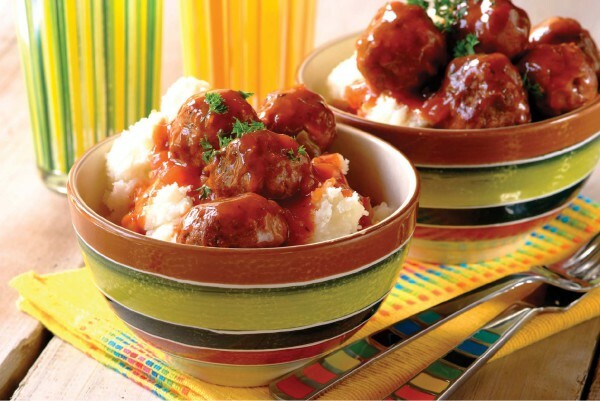 Roll into medium sized meatballs. 3. Fry in heated oil until brown on all sides. 4. For the sauce: Heat the oil and fry TOP CLASS Hot Curry Powder, green pepper and onion until onion is soft. 5. Add the syrup, vinegar, IMANA Tomato Soup and water. 6. Cover and simmer for 10 -15 minutes. 7. Add meatballs and simmer for a further 10 minutes. 8. Serve with rice or phutu. 1. Heat the oil and fry onion. 2. Add the minced meat, sachet IMANA Spaghetti Bolognaise Cook-in-Sauce, 400ml water and tomato paste. Stir well and cook slowly until meat is just cooked (about 15 min). 3. Prepare the cheese sauce by placing the contents of the 2 sachets of sauce in a jug. Add 500 ml boiling water and mix with a fork until the sauce is smooth and thickened. 4. 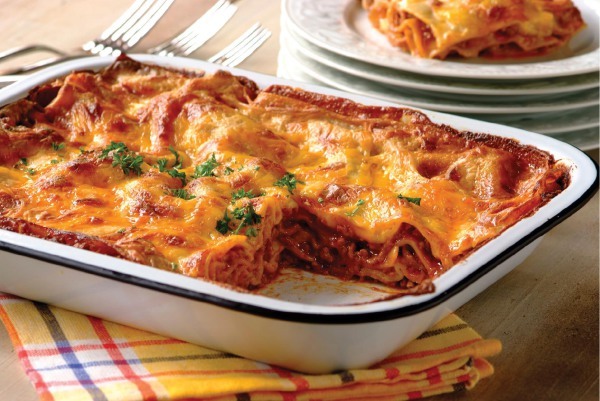 Arrange the meat, pasta and IMANA Cheddar Cheese Sauce in alternate layers in a greased baking dish. Repeat the layers until all the ingredients are used up, ending with a layer of cheese sauce. 5. Sprinkle a little cheese on top. 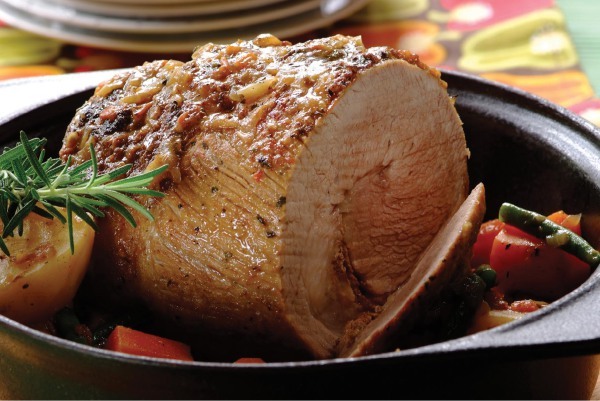 Allow to stand for at least half an hour before baking for 20 – 30 minutes at 180°C. 6. Serve with a fresh garden salad. 1. 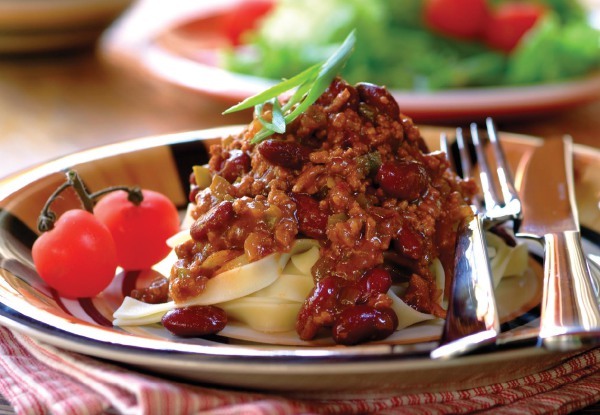 Lightly fry beef mince in hot oil in a large saucepan and add chopped onion, green pepper and crushed chillies. Keep on low heat. When the onion starts to soften up a little, stir in the tomato paste. 2. 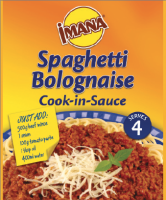 Add the contents of the IMANA Spaghetti Bolognaise Cook-in-Sauce, 400ml water and IMANA Chilli Beef Super Stock Cube. 3. Simmer for 8 – 10 minutes, and then add the kidney beans. 4. Cover saucepan and leave for 10 minutes, stirring occasionally. 5. Serve over pasta of your choice. 1. Brown meat in heated oil, add onion and fry for a few minutes. Season with crumbled IMANA Beef Super Stock Cube, pepper, mixed herbs and sugar. 2. Heat vinegar and beer and pour over meat. 3. Reduce heat, cover and simmer for 1 - 2 hours. 4. Add cabbage and potato and simmer until vegetables and meat are tender. 5. 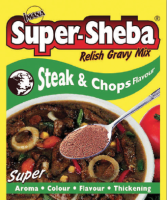 Stir in IMANA SUPER-SHEBA Steak & Chops Relish Gravy Mix to thicken the sauce. 6. Simmer for 5 minutes. Serve with pap or rice. 1. Peel the onion and grate it coarsely. 2. Add the mince beef, IMANA SUPER-SHEBA Tomato & Onion Relish Gravy Mix, chopped dhania and pepper. Mix lightly with a fork. 3. 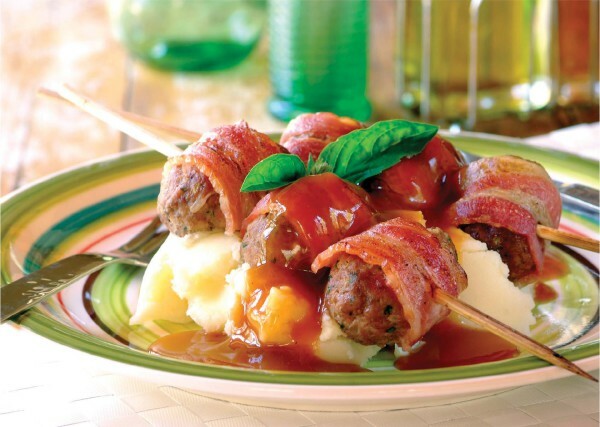 Shape the mixture with your hands into small elongated balls and wind half a rasher of bacon around each ball. 4. Thread three to four balls onto each kebab stick. 5. Grill the kebabs for 6 -8 minutes on each side until cooked through. 6. To make the mash, boil the potatoes in plenty of boiling water until soft. 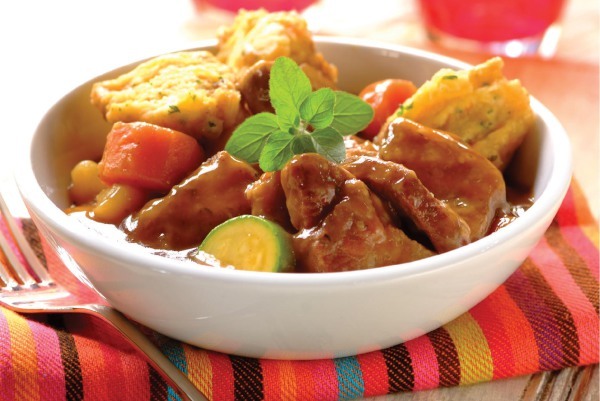 Drain and add the IMANA Chicken Super Stock Cube to the hot potatoes. 7. Mash the potatoes and crumbled stock cube together with the milk until smooth. Add the mustard. 1. Brown the brisket in heated cooking oil, then fry the onion. 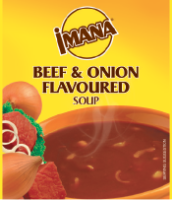 Stir in the IMANA Beef & Onion Soup and hot water and allow to simmer for 45 minutes or until the meat is tender. 2. Add potatoes, marrows and carrots and simmer for 15 minutes or until potatoes are cooked through. 3. For the dumplings, sift the flour and baking powder together. Rub in the margarine and the IMANA Garden Vegetable Super Stock Cube until they resemble fine bread crumbs. 4. Add the cold water to form a soft dough. 6. Cover with a lid and simmer gently for 10 minutes or until dumplings are cooked through. 1. Ask your butcher to prepare and roll the brisket for you. 2. Rub the dry IMANA NO.1 SOUP Oxtail Flavoured over meat. Heat oil in a large pot and brown meat all over. 3. Add onions and tomato and fry for a few minutes. 4. 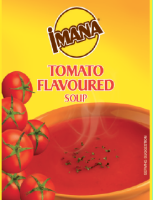 Pour in the water and add IMANA GOURMET Roasted Onion & Leek Stock Cube cover and simmer for 1½ hours or until the meat is almost tender. 5. Add prepared vegetables and mixed herbs. Simmer for 25 minutes until meat and vegetables are cooked.